Pet allergies are fairly common, especially in those who are already prone to allergies. The Asthma and Allergy Foundation of America notes that up to 30 percent of those who suffer from allergies have a pet allergy as well. It can be so hard on children who desperately want a pet but suffer from the sneezing, itchy eyes and runny nose that can accompany contact with certain animals. Luckily, some pets are ideal for kids with allergies, and you can bring them into your home with confidence. If your child has his heart set on a dog, research low-allergen breeds. The American Kennel Club notes that some dogs, mostly of the terrier family , are low-allergenic dogs, meaning they don't produce as much dander as other breeds of dogs. Schnauzers, Portugese water dogs, malteses, bichon frises and Chinese cresteds are all among dogs that don't shed and create dander, perfect for kids with allergies. When cats lick themselves, the saliva dries on the fur and is later released into the air, notes KidsHealth. This is ultimately what causes the allergic reaction. A hairless cat can help solve the problem if you have a child who wants a kitty. Sphinx cats are nearly completely hairless and, though expensive, may solve the allergen problem in your home. 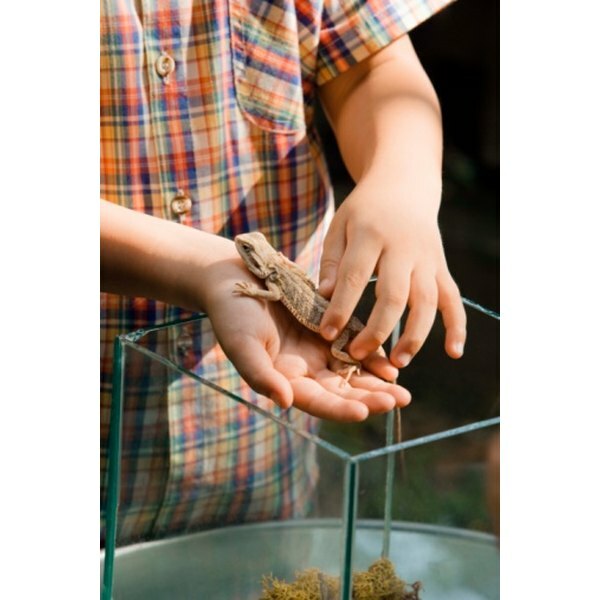 Reptiles are an alternative option for children who can't have furry cats and dogs in the house. Snakes, lizards and turtles are all dander-free and technically hypoallergenic. They can be kept in a separate tank or habitat so they are clean, quiet and contained. Reptiles also present a good opportunity to learn about animals and their behaviors, simply by watching their pets. While fish may seem like an ultimately boring choice for a pet for many children, they are fine for those with allergies. If you feel as though a fish is the best choice for your family, make a big deal about going to pick one out, naming it and buying supplies so your child feels excited to bring home a new pet. You can even offer to let him keep his fish in his room and allow him to take care of it on his own, all without having to worry about allergies. Birds, while they may seem like low-allergenic pets, can create dander through their feathers. If you want to purchase a bird for your allergic child, look for one that can be kept in a cage that is well-maintained, notes the American College of Allergy, Asthma & Immunology. The feathers and droppings of the bird can cause an allergic reaction, so placing the bird outside of the child's room should make the bird a safe choice for a child with allergies. AAFA: Who Gets Pet Allergies?